You can have a brilliant idea and highly skilled professionals in your team but if there is a lack of project management and not enough collaboration, it all can be in vain. For sure, project management is a crucial and at the same time complicated process that requires a lot of effort and time. Thankfully, technology has also touched this sphere and there are many web-based project management tools that are pretty easy to use, and they are an important part in making the process run much more smoothly. So, here you have 7 project management tools, which have proved their significant functionality and are going to be a great help when it comes to organizing a project. Asana is a project management tool you must have heard about before. Having got more than a million of users, it is widely used both by large-scale companies with well-known names (Pinterest, Uber, Dropbox, Stripe, etc.) and small local businesses. It is an intuitive and pretty simple-to-use tool, which doesn’t require a lot of time to adapt. With Asana, you create projects adding tasks within these projects and subtasks within these tasks. You can add your teammates, assign particular tasks to them, impose the deadlines, and track tasks executing. 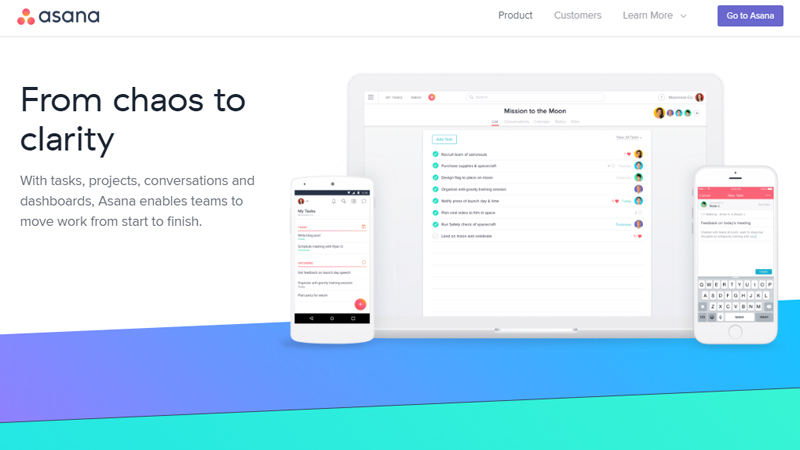 Asana provides good communication capabilities enabling real-time interaction, project and tasks conversations, team pages, and status updates. There are also attachments to add files to the tasks or conversation, hearts to put your reactions, tasks dependencies, templates, different integrations (Dropbox, Google Drive, Google Sheets, Slack, and many more), views (calendar, dashboard, inbox, etc.) and team management (teams, followers, guests, admin and privacy controls) tools available. Pricing. Asana is free when there are up to 15 people in a team. For those who want more members to join or need extra features, it offers a Premium version for $9.99 per member per month. In addition, there is the Enterprise version which provides more control and support. Trello is one more hugely popular web-based project development tool. This tool is based on kanban boards and, actually, Trello made them that famous. It is simple to use, colorful, and let you manage any projects without much effort. Having got a blank board from the beginning, you create your project and start building a workflow, adding cards, which represent the tasks within the lists that represent a stage of their progress. To each card, you can add a title, description, checklist with subtasks, due date, attachments, labels, comments, etc. As the tasks forge ahead, you can drag the cards across the lists, which illustrates how the working progress is developing. On each board, you can find the members it is shared with, recent activity, and other settings. In addition, you can add more functionality to it, such as calendar view, card voting, and card aging. You can also put some stickers on the cards or archive some items if there is a need for it. Moreover, Trello is suitable for collaboration, providing comments, mentions, emoji as well as notifications and deadline reminders. (or less) per user/month, which include some advanced features. 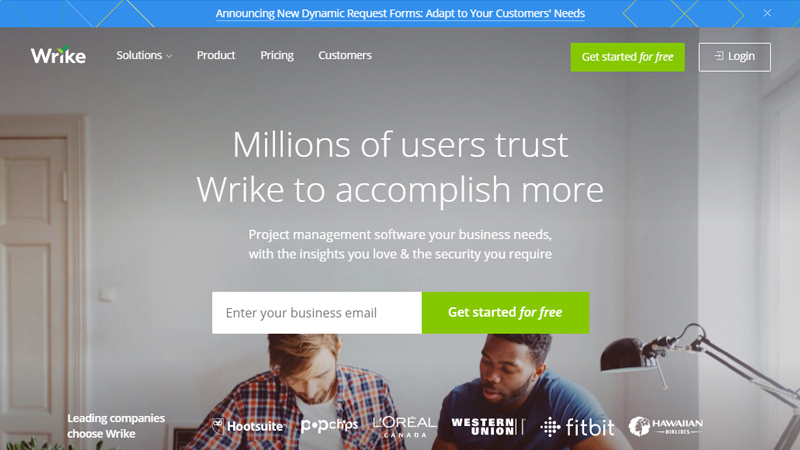 Wrike is the project management and collaboration software for achieving greater performance results. With this tool, you get the view of your project going in real time and are able to track its progress. Wrike combines both spreadsheets to see the overall picture and to-do lists for setting clearly what to do next. On a dashboard page, you can see overdue and due today or this week tasks as well as those overdue by you and your backlog. Moreover, there is an activity stream to look at the updates made by the members of the team. Besides, there are folders, which serve as project pages and subfolders as tasks for each. Clicking on a task, you can assign it to somebody, add dependency, attach some files, change the due date, share it with some other members, etc. In addition, there is a built-in time tracking system and you can track how much time it takes to complete a particular task using its time tracking button, present in every task. There are also general activity stream, dynamic Gantt charts to visualize your projects more, workload section to see the tasks of each team member, and more features. On the whole, Wrike is easy to use, provides broad storage options and integrations with Google Drive, Dropbox, Box, and many other tools. Pricing. Wrike offers different plans for different prices. Among those, there is a Free plan available for a small group of users (maximum 5). Paid plans start from $9.80 per user per month. Dapulse is a management tool, which is about keeping the members of the team on the same page to get things done and visualizing how the working process is getting on. Dapulse offers flexible and customizable spreadsheet to illustrate the tasks needed to be done within specific frameworks of time, such as weeks, months, or quarters ahead. When you have a project, you put down the list of tasks to do and add columns to these tasks, which illustrate the stages these tasks must undergo. You can color the stages depending on the level of their executing. For instance, red can express denial, green – that it is already done, and orange – the work is in progress. Therefore, at a single glance, you can see how your project is being done, what has been finished, and what is left to do. Overall, among its features, there are easy collaboration and communication, email notifications and updates, idea and issue management, knowledge base, integrations with Google Drive, Dropbox, Salesforce and more tools, budget management, resource management, time and expenses tracking, and more. Pricing. There is a possibility of free trial and several premium packages (Basic, Standard, Pro, Enterprise) with minimum 5 users. The price of packages varies depending on the number of the members of a team and features required and starts from $25 per month for 5 users. Zoho Projects is another web-based project management platform for planning projects, tracking them, and enabling team collaboration. It offers advanced project planning, which includes milestones, tasks, subtasks, recurring tasks, and dependencies. There are Gantt charts to visualize the progress of the project, kanban boards with the columns illustrating priorities or assignments, timesheets, which allow members to log billable or non-billable hours and receive invoices, bug tracking to log bugs and follow the fixing, detailed reporting tools, document management, integrations with Google Apps and Dropbox, and many more. Within this tool, you can choose the project access – private for the users added to the projects and public for all the users in your portal. Its extensive collaboration features involve real-time project chats for communication and forums with interactive message boards. There are also feeds to stay updated with what is happening around – the on-going discussions, tasks added, comments made, documents uploaded, etc. Pricing. Zoho Projects offers a free version, which allows creating only one project with up to 10 MB storage and several paid ones. Paid plans range from $25 per month for 20 projects and 10 GB storage space (Express Plan) to $80 per month for the unlimited number of projects and 100 GB storage space (Enterprise Plan). There is also an unlimited number of users available in all the plans without any extra costs. FreedCamp is an online project management tool, which was designed in mind with making most of its functionality available without any fees. Traditionally, you start a project, create to-do lists within this project, assign them to someone, put a due date, and share this task with other users. You can also set the priority (low, medium or high) and attach files to the task. On the Dashboard, you are able to see the recent activity and create different type of widgets, which will be visible only for you. It is also possible to create discussions on different topics and add comments there. Besides, there is a Wall that looks like a chat system and provides communication in real time. Moreover, FreedCamp offers making tasks lists or sticky notes as known as kanban boards, creating milestones to empathize the most important things, detailed calendar to view the to-do’s, milestones, events, bug tracking, file sharing, invoicing, etc. Pricing. FreedCamp is free for unlimited users, projects, and storage. Additionally, you can get Subtasks Pro and integration with Google Drive for only $4 per month. 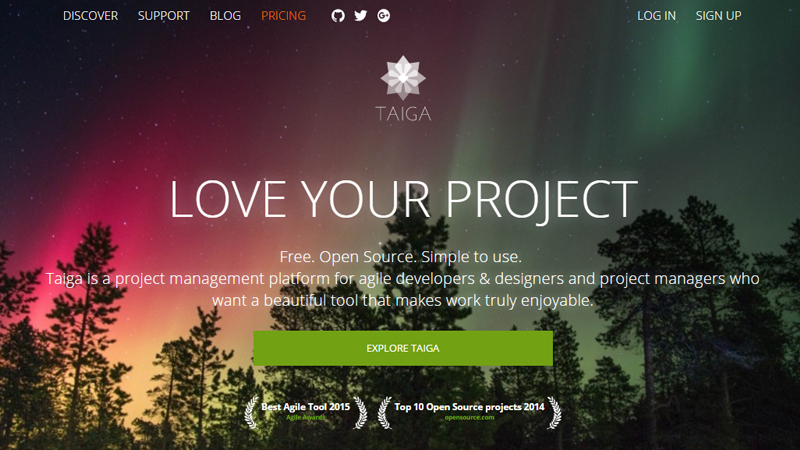 Taiga is the open source project management software perfect for agile projects. It is used by developers, designers, project managers, and other followers of agile methodology. To create a project, you can choose the template you want (agile or kanban). Selecting agile allows you to create sprints and add user stories with the tasks there. With kanban board, you create cards, which represent user stories and drag them across the lists, which illustrate the stages of execution. Within a user story, you can put the name and its description, how much it needs to overcome that task in points for each category – UX, design, front-end, back-end, set the progression stage, use tagging system, etc. There is also a timeline page to view the recent activities and team page to see the power of each member. On the whole, Taiga provides tools for collaboration, task management, bug tracking, time tracking, and so on. Besides, there are integrations with GitHub, Webhooks, Bitbucket, and Gitlab available. Pricing. Taiga offers Public and Private projects. If it is a Public one, you receive all the features plus the unlimited amount of users and public projects without any costs involved. On the other hand, when it comes to Among Private projects, there are Seed plan for one private project with up to 4 members free of charge and other paid plans, prices for which increase as the number of private projects and members involved grows. Therefore, the market offers plenty of project management software to choose from. And while there are many discussions about which one is better and which functionality is more powerful and necessary, one thing is clear – using project management software is a way to organize your project more efficiently with higher level of productivity. For certain, there must be a tool out there which has a look and feel perfect for your project. Hopefully, this article has helped to find the best fit for you. Have you got any experience with project management software or use any other tool not mentioned here? Share with us in the comments. We will be glad to know your opinion. Great article. I’m a big Trello fan and have had some good experiences working with Asana. If any of your readers would like to research these tools in more depth they are welcome to visit IT Central Station, where we have peer reviews for most of these tools, shared by It pros who have worked with them. You can also view comparison charts to see how users have compared the tools to each other, like this one (https://www.itcentralstation.com/products/comparisons/ca-ppm_vs_wrike/tzd/c326-sbc-94) for Wrike and CA PPM (which is a popular pm tool on our site). Hope your readers will find this helpful. Hi there. You forgot about IC Project (https://icproject.com). Is better than trello and easier than jira. We will check this tool.